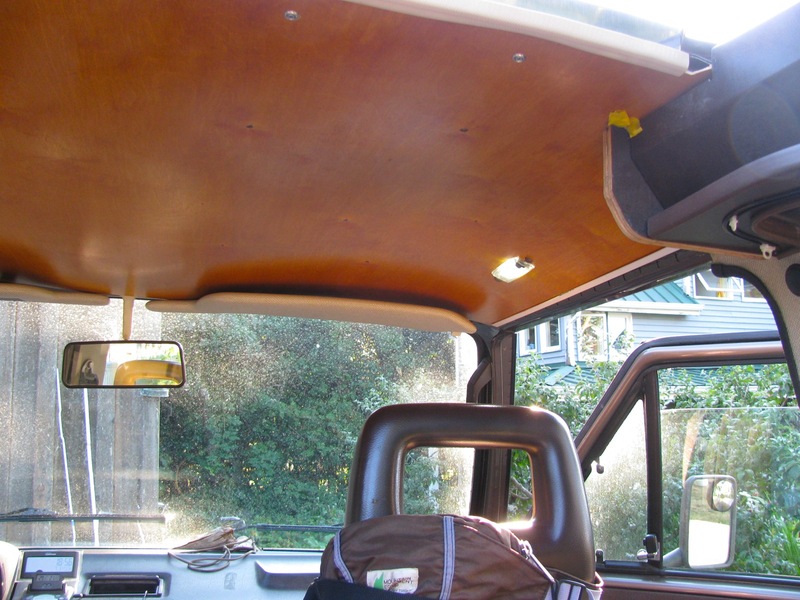 The rear wardrobe is not secured in these pics, but you can see how there will be a bit of a gap between the top of it and the headliner. 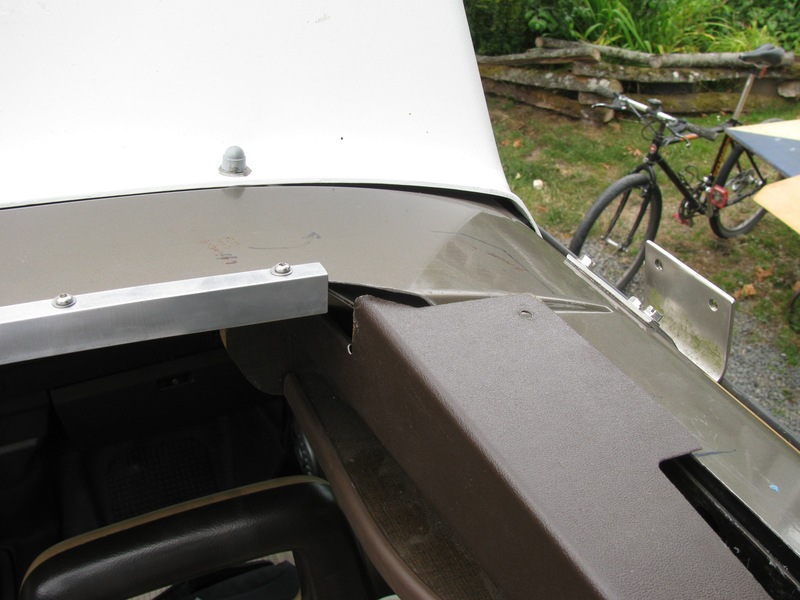 I also drilled and tapped (5 x 0.8 mm) the aluminum angle that support the door valence and the kitchen troughs. 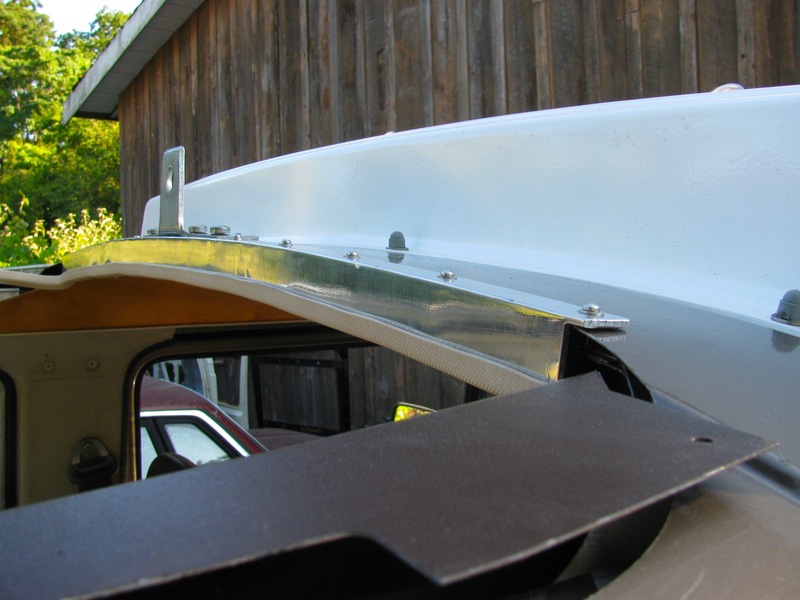 The stock westy uses sheet metal screws but seeing as the angle is 1/8″ thick, I needed to use machine screws. These are scavenged screws shown, if I get around to it I’ll buy some shiny new ones. 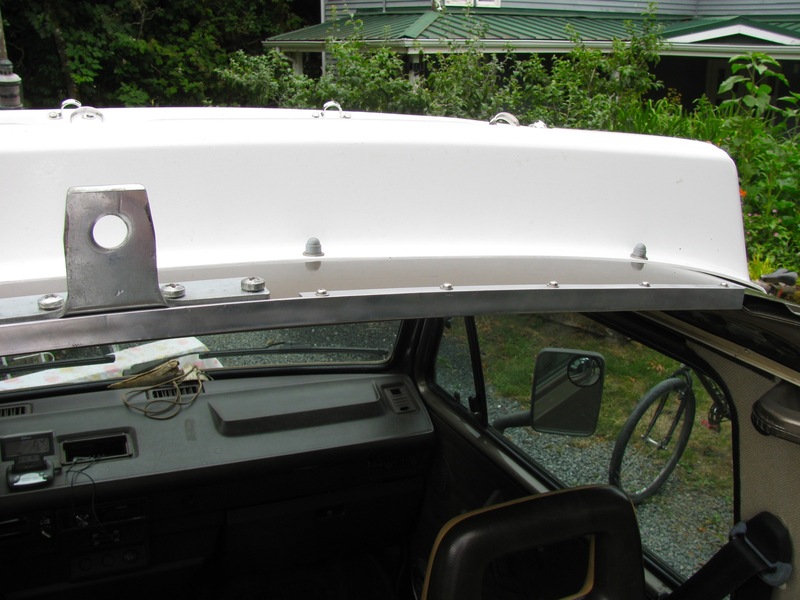 I used the wiring for the rear, driver’s side interior light to power the fluorescent light that is mounted to the underside of the trough. The trough was a bit tricky to install, the hidden ledger strip was a pain to position. Doesn’t seem like I did much does it? The headliner was the time eater, applying the finish and cutting to shape. I did spend some time pondering the modified hinges for the fold out upper bunk, that is going to be fun as is figuring out how to finish those exposed curves in roof. 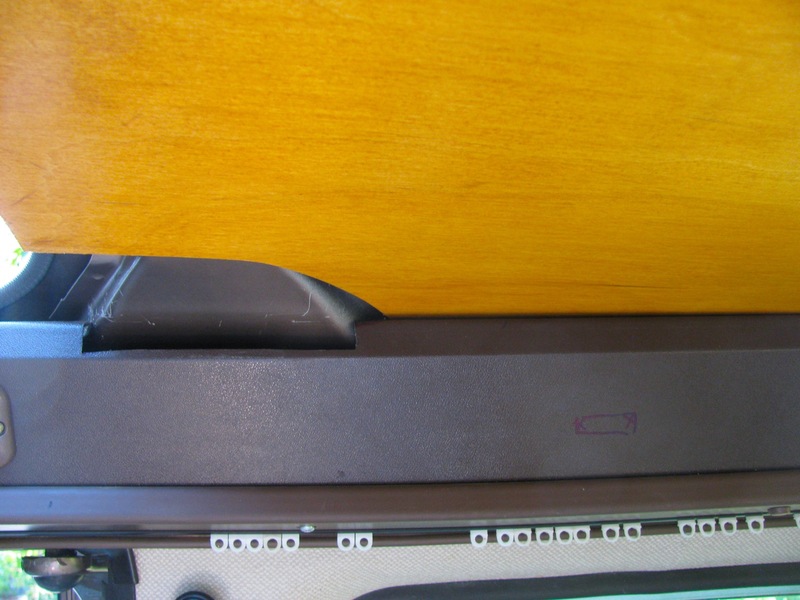 Leave you with a picture of the passenger’s side light on the front headliner. Makes a big difference having a light there, no, really it does. 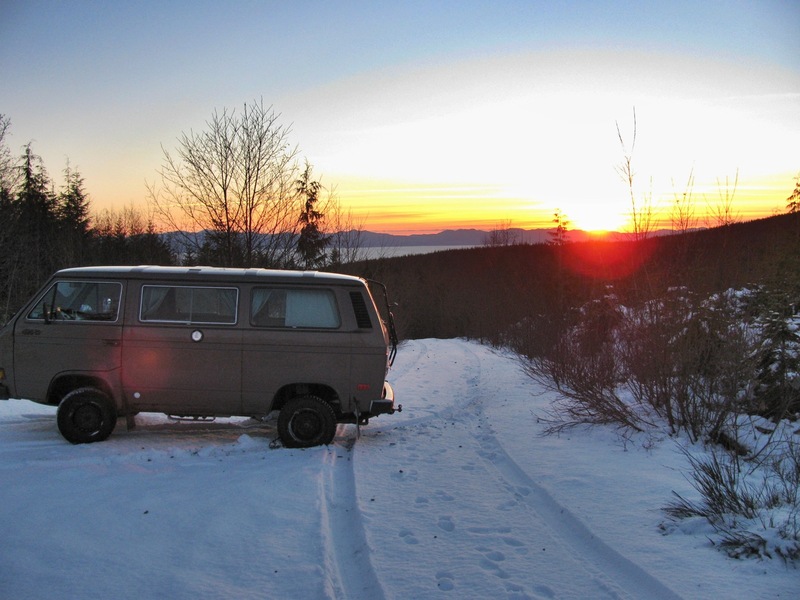 Edit: Ed, if you are reading this, I’m waiting for more updates on your syncro project. Past couple of days has been one step forward, two steps back. 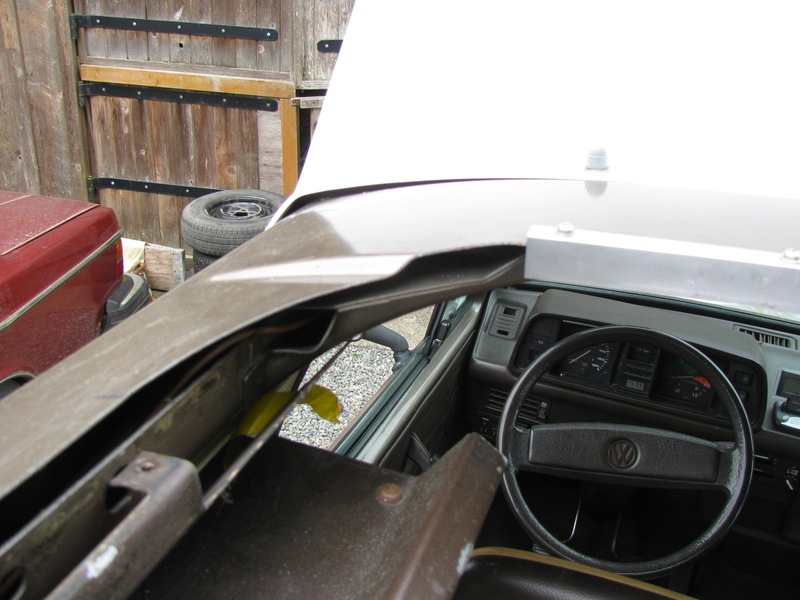 First problem was when I glued on some 1/4″ closed cell foam to the backside of the front headliner (for a bit of sound and thermal insulation) and then discovering that doing that had changed the arc that the panel springs into when installed. 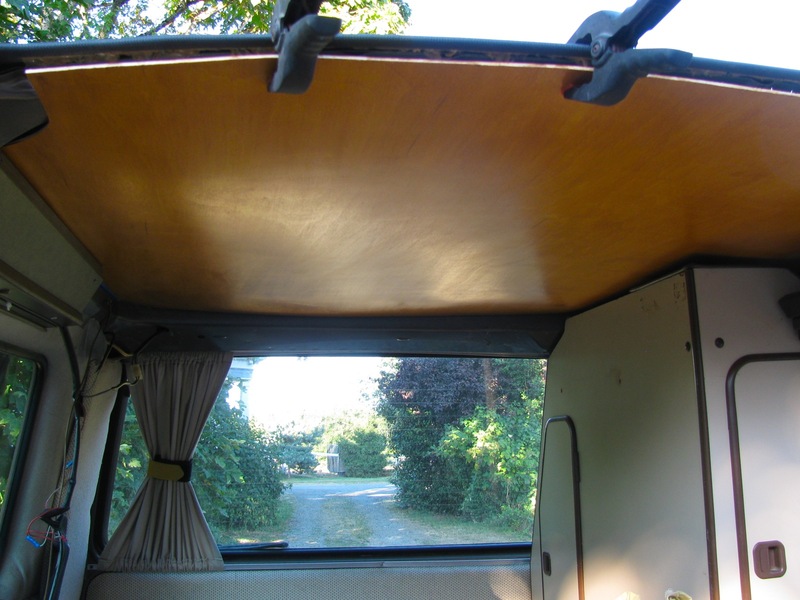 The result was slight bit of wavyness at the rear edge of the headliner, and a tiny bit at the front. 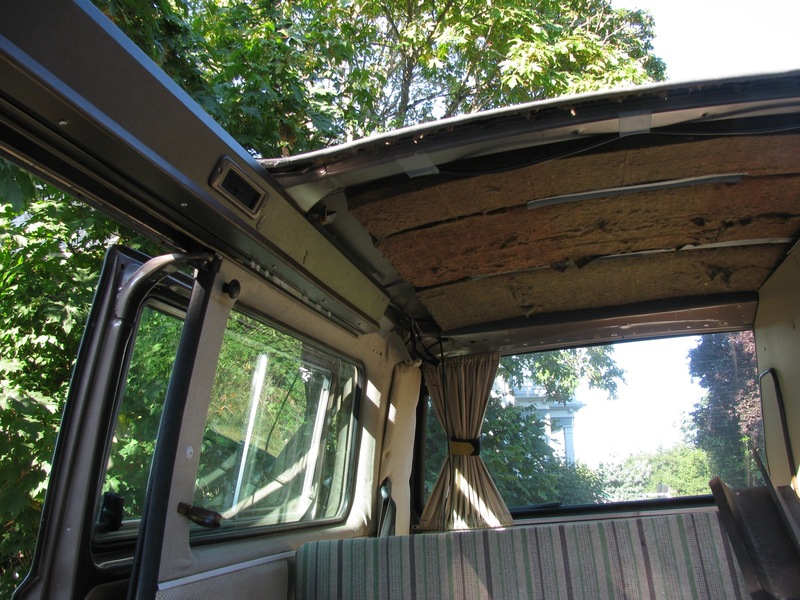 I could have planed off a smidgen from each side of the panel but I’ve decided to see how it works out once all the screws are in place – the rear screws are in and that has helped, the front screws that also hold on the front window curtain are yet to to be installed. I wired in a passenger side light, tapping power and grounds from the driver’s side unit. 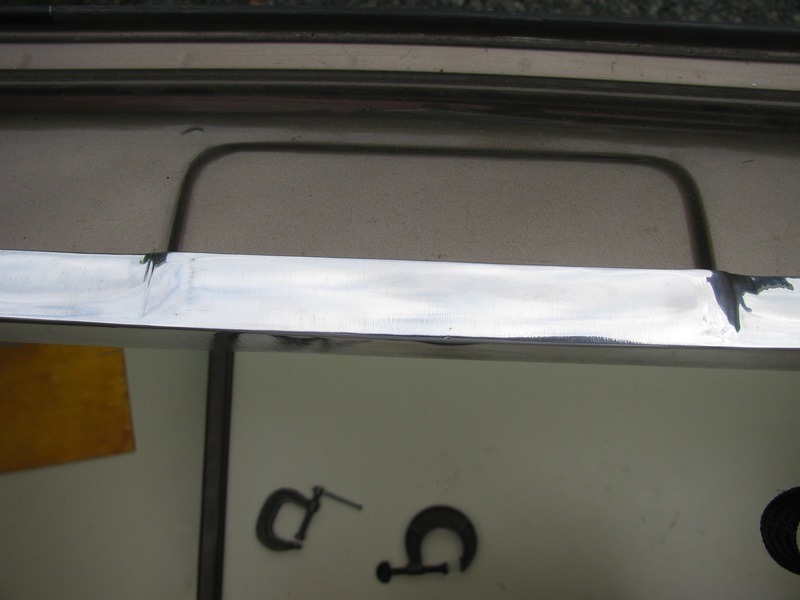 The rear edge of the headliner was exposed and lay below the aluminum channel that I had screwed in place on the front edge of the cut out hole. I couldn’t find a satisfactory way of finishing that edge so I decided to make a new aluminum piece out of aluminum angle instead of channel. 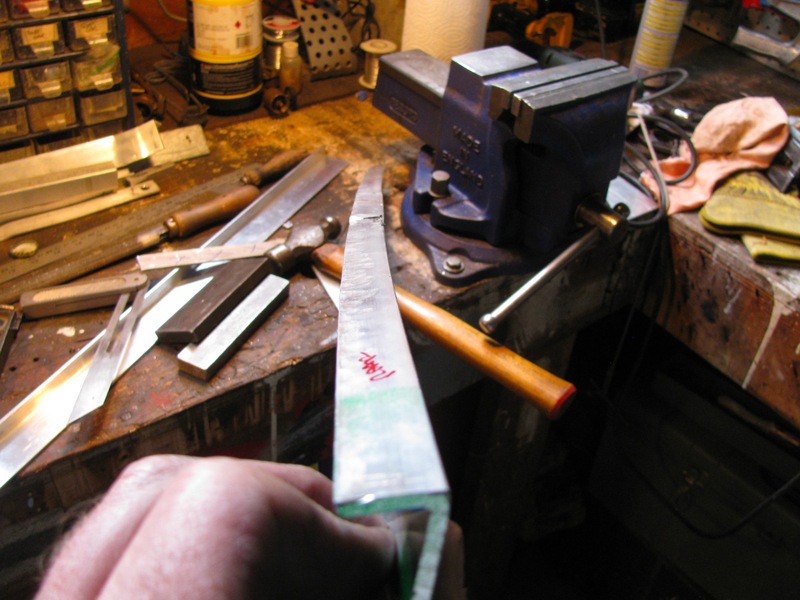 I should have done this from the start, the vertical leg of the angle mimics the turned down edge in the stock westy. Bending the angle was not as easy as the smaller (and thinner) channel, and the end result shows some dents from the bending jig. Here are some shots during test fittings. That stock westy flex moulding works out fine. 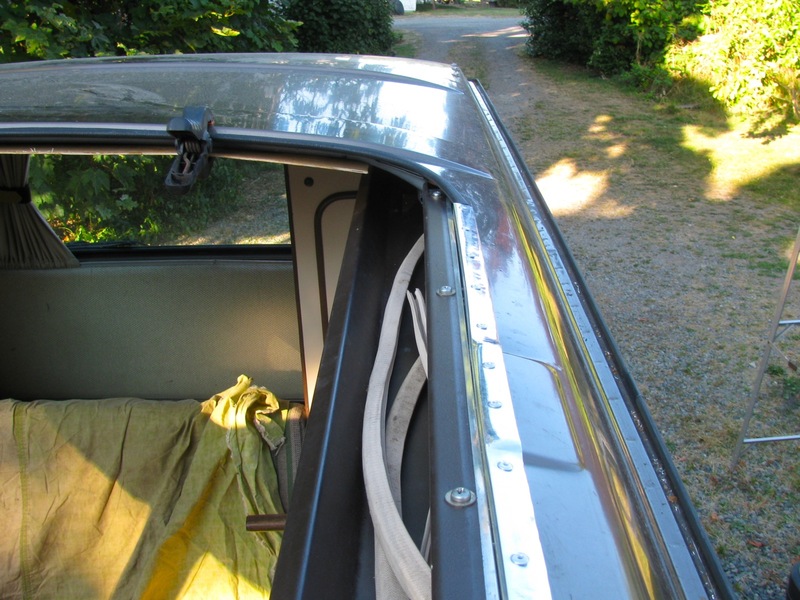 The slider door valence is secured by the hidden angled brackets, but still need to be screwed down on the aluminum angle and to the roof at the very front. I’ve not done that yet as I am still not sure about how to hide the exposed roof edge at the front corner. Here is a shot of the mid to rear part of that valence in the van. Obvious that I haven’t got the rear headliner installed yet. 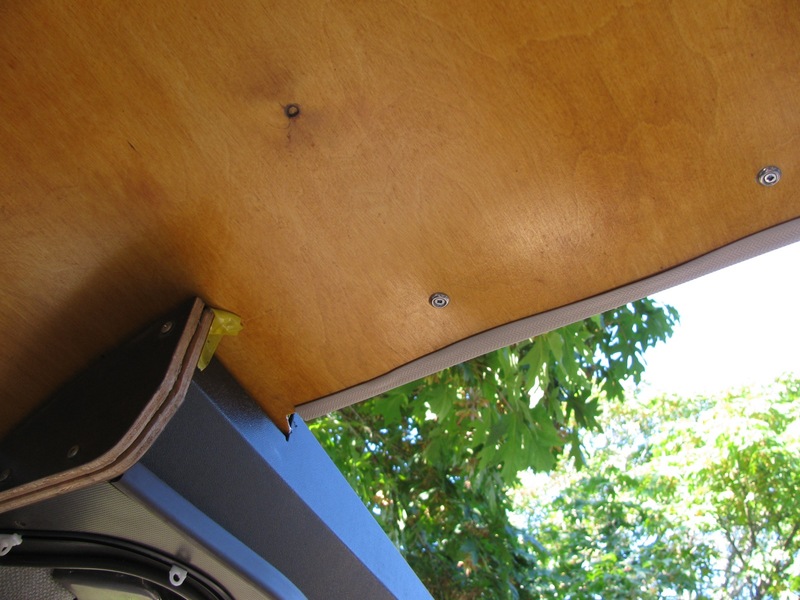 Trying various ways to trim, and somewhat strengthen, the edges of the sheet metal roof exposed by the pop top hole. Along each side there has to be a ledge to support both the bed and the pop top lifting assembly. 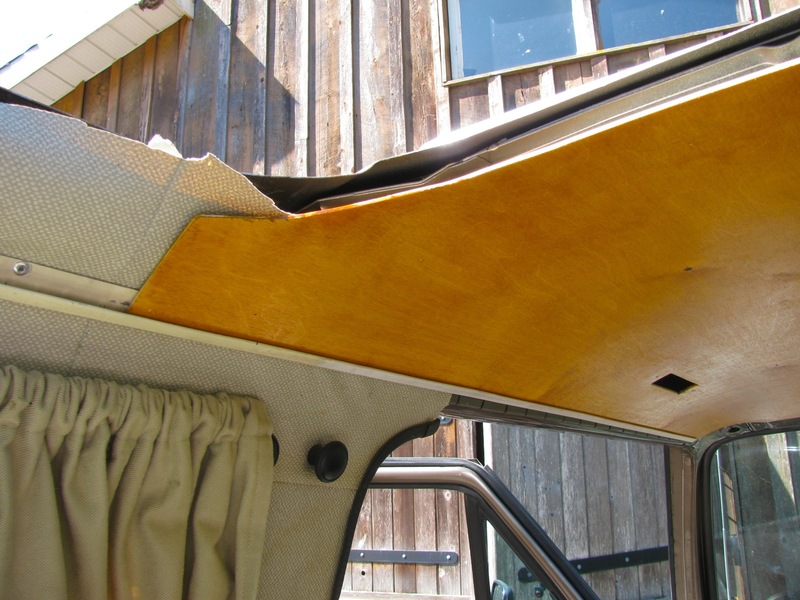 At the front edge, you have to install the pop top latch (and support it) as well as merging the wooden headliner to the cut edge. 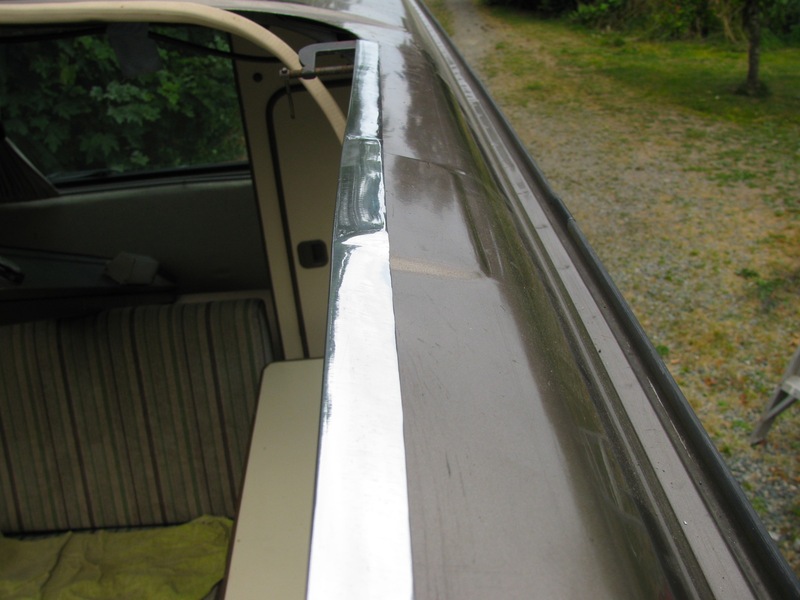 At the rear edge, not much has to be done, just cover that metal edge. I’ll begin with the front edge. I decided to use some aluminum, U-shaped, to span that edge. 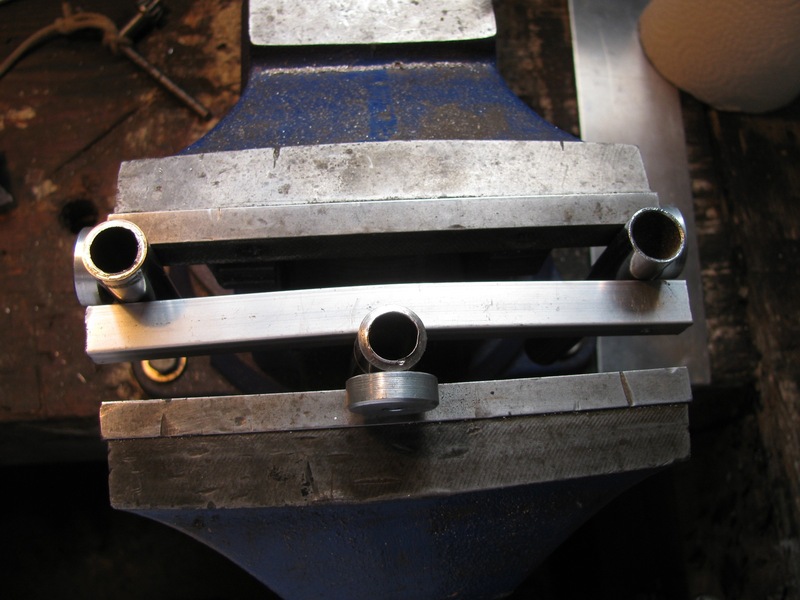 I bent it to match the roof curve with a very rudimentary jig in the vice. Here it is practicing on a scrap bit. You squeeze a bit then move on a little, etc. Of course I practiced with the U channel in the wrong orientation then proceeded to do the real bit the same way. Grr, had to straighten it out and re-do. But I got it done, drilled holes for some stainless sheet metal screws and a cut out around the latch. 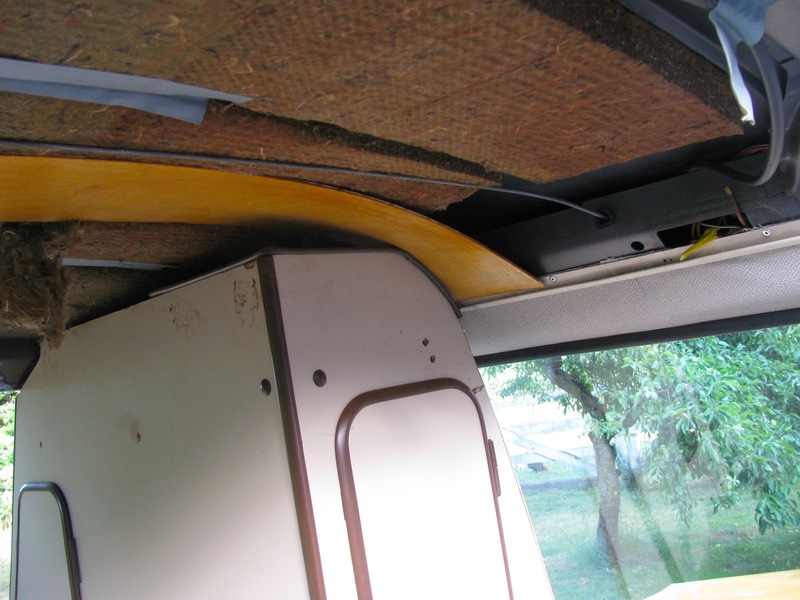 The plywood headliner comes to the rear edge of this channel, and I think will be gussied up with some edge moulding stuff, or something. 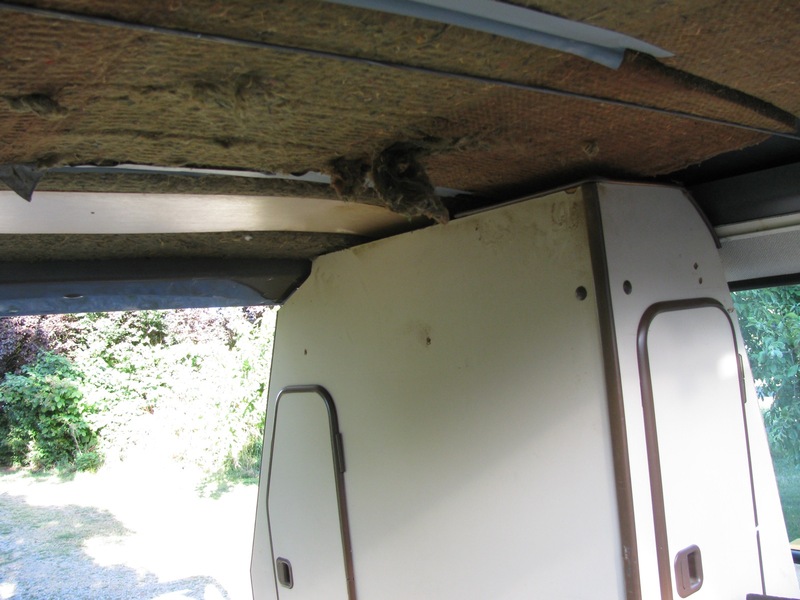 The latch has a backing plate, but whereas in the stock westy roof that backing plate lies in an area supported on one side by the crossmember flange, and on the other side by the turned down hole edge, on my van I don’t have the turned down edge and the crossmember flange is spaced away from the roof by about 1/4″. So I installed a 1/4″ thick bit of aluminum, the same shape as the backing plate, in that space. 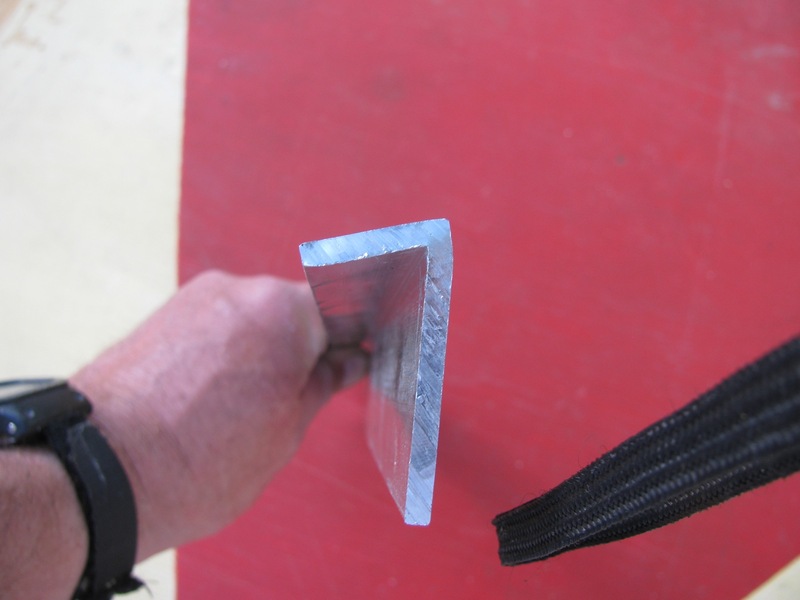 I didn’t take a picture of that but here is a shot of the backing plate (you can see the gap between the roof and the crossmember flange here). 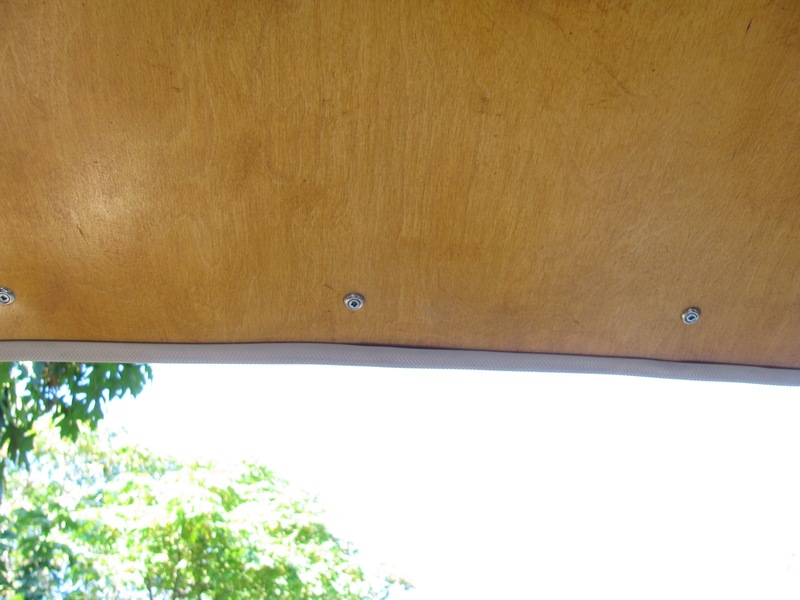 Well you can see a bit of that spacer in the pic below, and I should mention that the holes drilled through the roof are elongated side to side for latch adjustment. 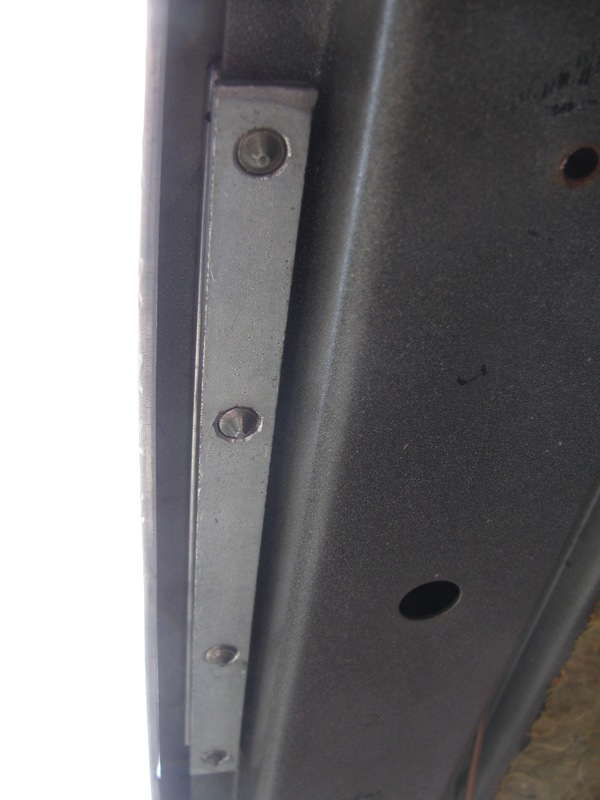 The latch plate itself has holes elongated front to rear. You can see that with that intermediate plate the bolts just barely come through the backing plate. Now some trial fits with the kitchen trough and the door valence. Door valence first. See how I have to come up with some sort of trim and support for the corner? Same sort of thing with the trough (trough end cap is not in place). Now onto the sides, I had to form a bit of aluminum angle to bridge the space between the box section and the roof. 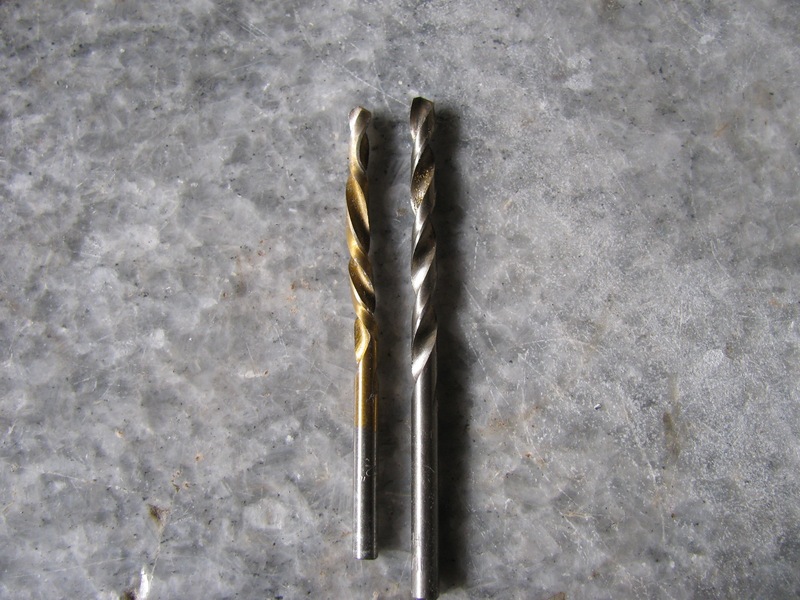 It was “just” a case of some cold forging. 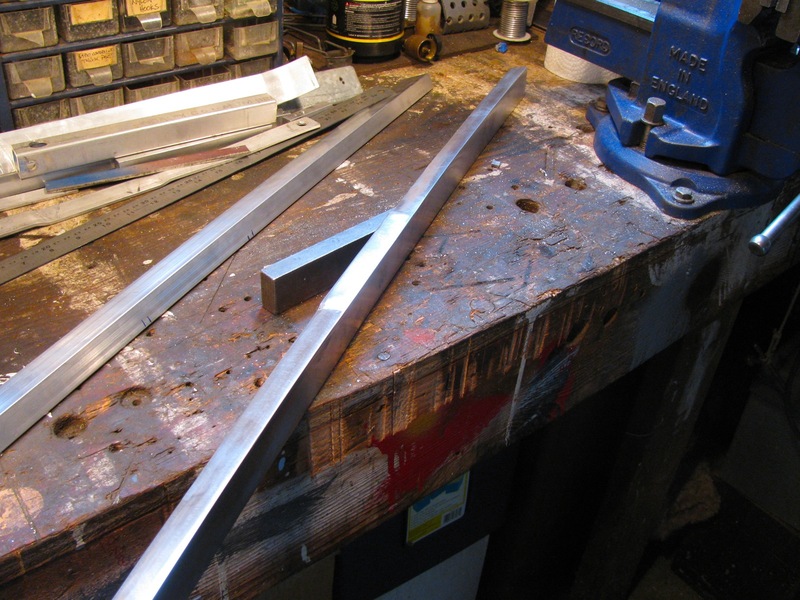 Bending the angle to less than 90 degrees stretched the metal where I hammered, so the piece came out slightly curved. No big deal, it will pull back into shape when installed. I had to form a little hump to conform to the roof moulding. Then clamped into place for trial fit. The crudely shaped portion over the roof moulding. This angle will be pop riveted into bot the box section and the roof. Another aluminum angle will be pop riveted to the vertical part of this to provide the support base for the pop top lifting assembly and the bed extension support. More on that later. I’ve been remiss not to thank all those who have commented and encouraged me with the pop top conversion project. At times I’m somewhat paralyzed with doubt and indecision during the process, and as I am pretty well working alone (my own choice I guess, I’m pig-headed) the feedback I get either in the comments here or by email have been very much appreciated. 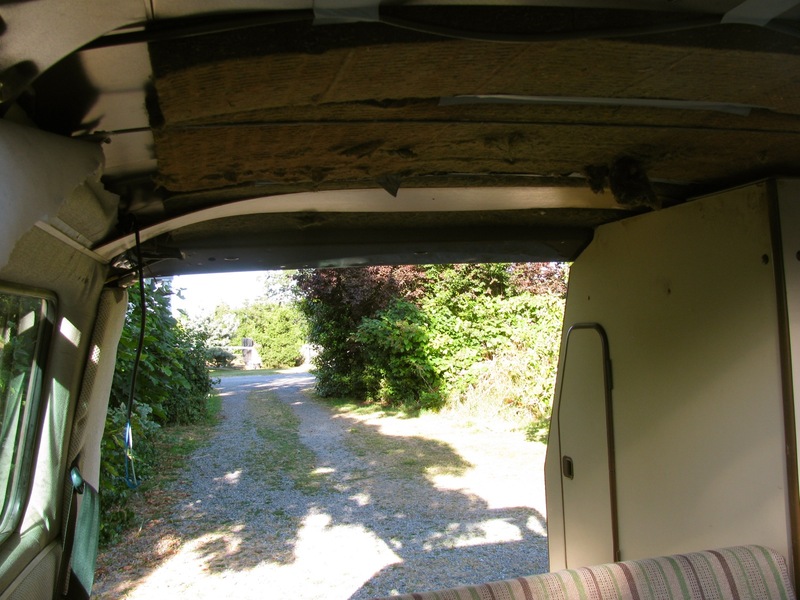 I’m looking forward to doing this again, but with headroom. Not as much progress as I would have liked today. Was warm for these parts, 27 C or so (yeah, not hot), and I mostly got a suntan on the back of my neck as I mulled over how to treat the cut opening. I am heading to copy what bquip did in this samba thread, but probably won’t laminate plywood for the ends as he did. I’m leaning more to aluminum all round. First thing I did was put on another coat of Sikkens Cetol 1 on the front headliner, this time with fine steel wool followed by a rub with a dry rag. Skipping ahead to the end of the day, the finish was dry and I rubbed on some wax and did a test fit. 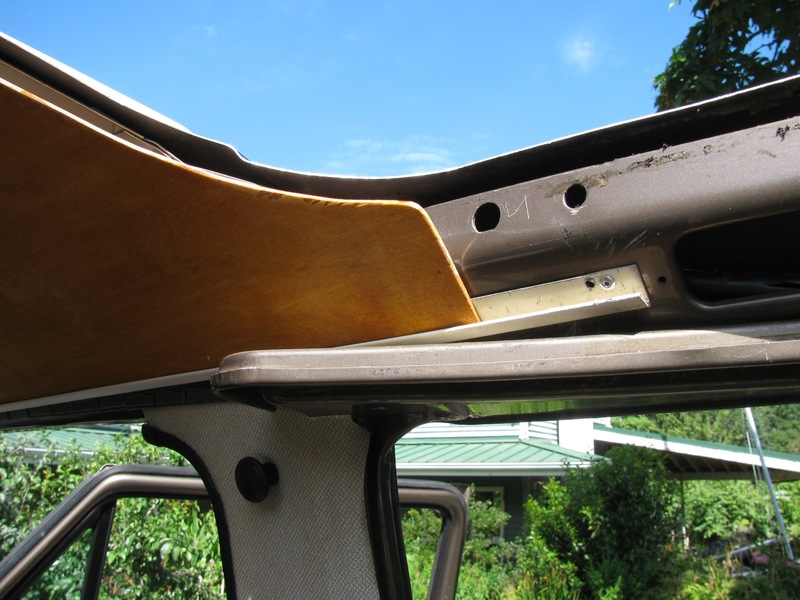 The slight buckle at the front will be eliminated when I screw the headliner to the metal above the windscreen. These screws have double duty, they also attach snaps for the front curtain. Boy the picture sure shows up the flaws in the finish. I added a hole on the passenger side for another light. The rear sides are shown next. 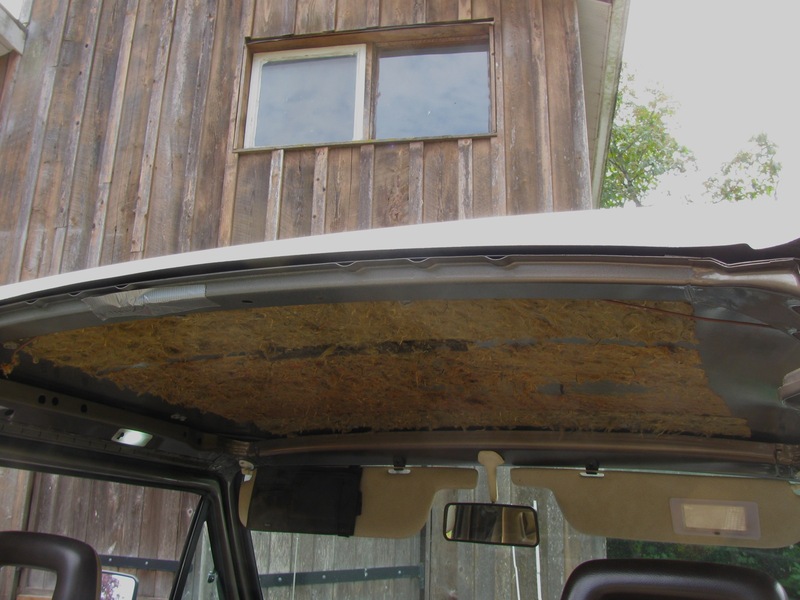 Actually these pics were taken when I did a first trial fit before the headliner was finished. The exposed edges of the wood will be covered by trim moulding. I trimmed the roof a bit more on the sides so the roof was flush with the box section. I experimented with bending some aluminum angle to see how well I could match the angle between the roof and the box section. 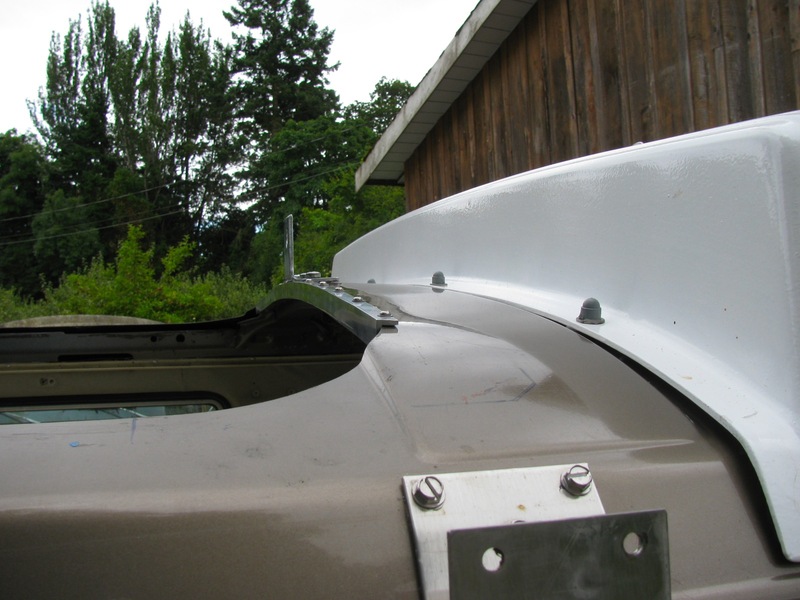 Just as bquip did, I will pop rivet the angle onto the roof and box section then attach another bit of angle to act as support for pop top lifting assembly and the fold out portion of the bed. I’ll also have to form that angle so it conforms the the ridge on the roof skin (foreground in above pic). 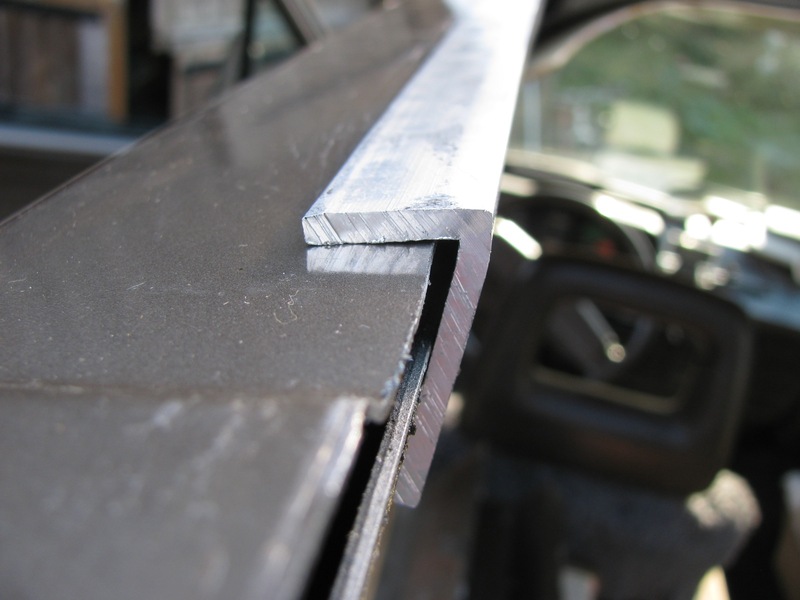 Those ledger strips I attached continue on to the rear of the van. 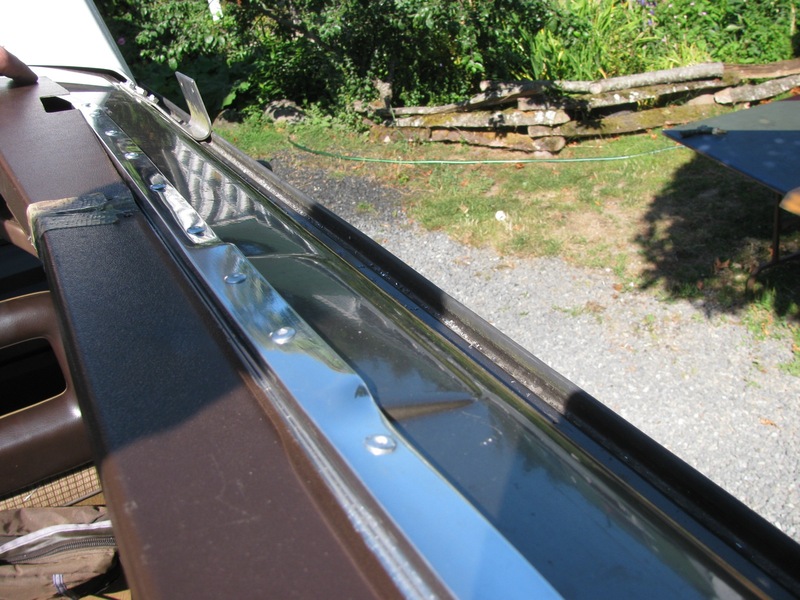 I installed them even though I have the later model door valence and kitchen trough which hides the area above the strip (it is exposed on the earlier model westies). 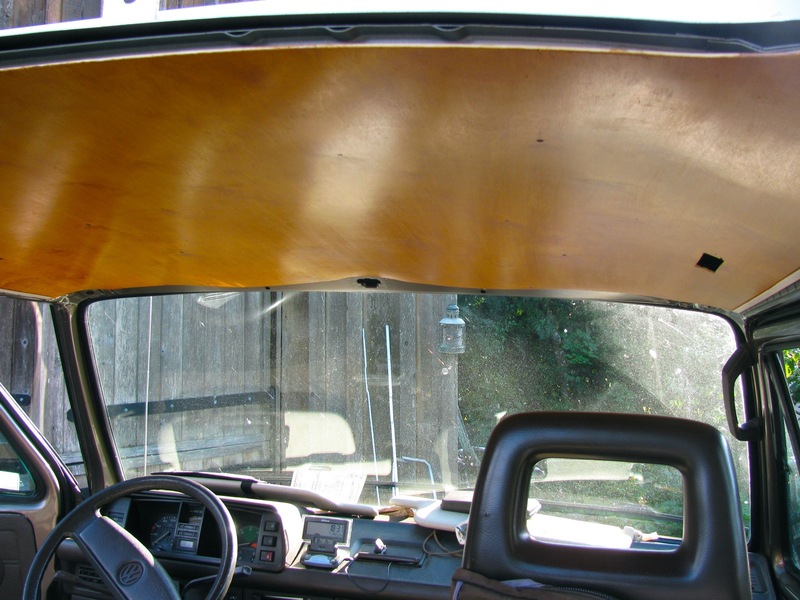 I did it so that I could try springing a plywood headliner in the rear. I’m not sure it will work easily, a test with a narrow bit of scrap shows that the wardrobe end interferes with the plywood. I’ll have to do some cutting of the headliner to make it fit. 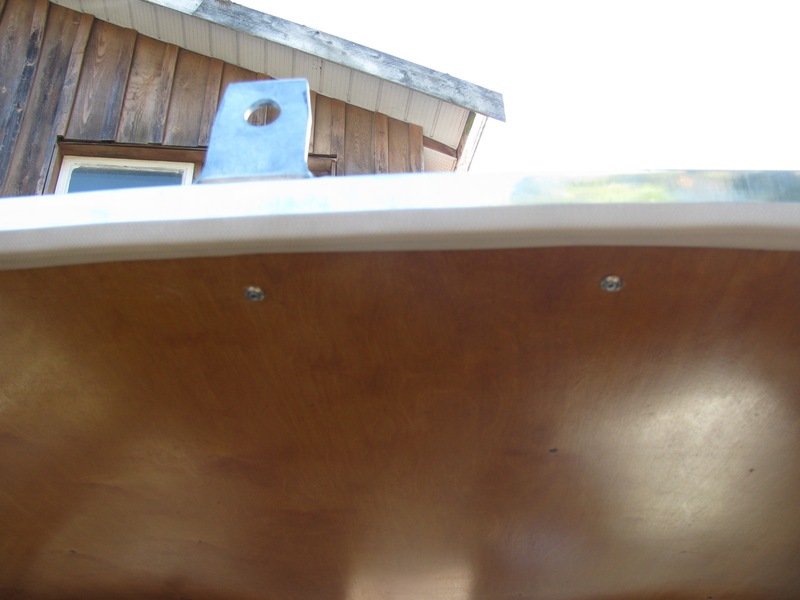 The plywood fits at the rear, shown here. But not so well at this point. But I think I can make it work. 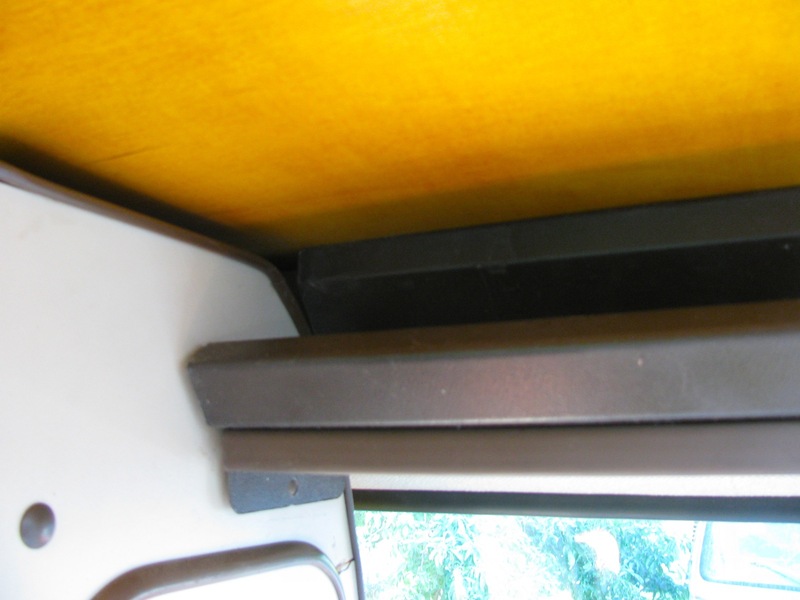 Edit – I’m an idiot, I just realised that the “valences” (trough on kitchen side, and the one on the door side) will interfere on both sides. 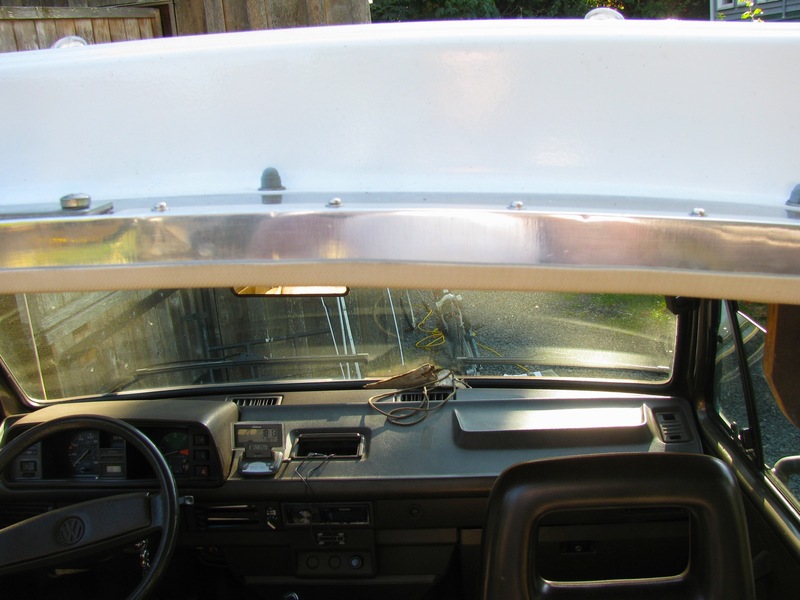 I think then I will fit the headliner into the gap between the roof and the box section, trimming at the forward end to fit around the cross member. Last fall I threw some Giant Burdock burrs down on the front garden. It may seem crazy, but I like the plants but I won’t let them spread. The flower stalks haven’t appeared yet but the leaves are huge. 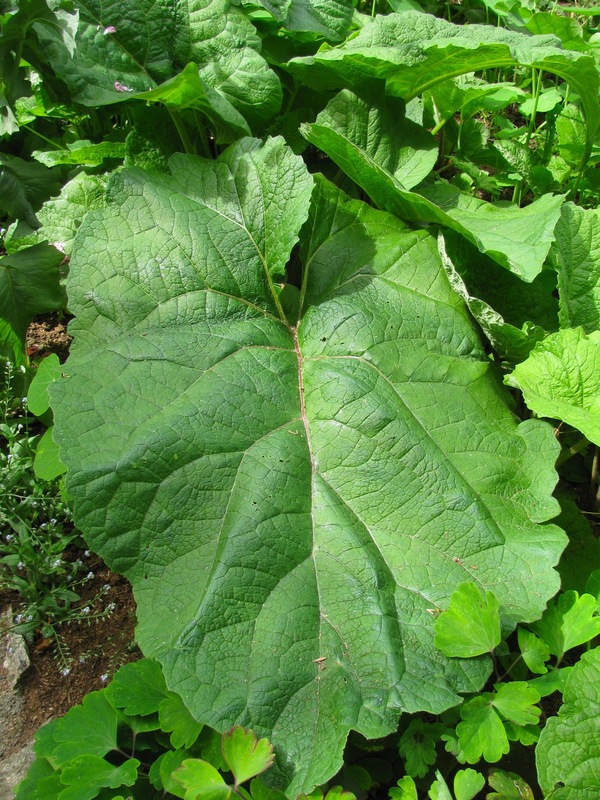 Edit – I didn’t know this, “Burdock has the little known yet precise designation monocarpic herb. This means a seedling grows for a varying period of years, usually two to four, until its root has stored enough energy to produce a flower stem. The plant dies only after flowering. In a shady, dry location Burdock must wait a long time. Rich soil, well-bathed in sunshine, lets Burdock send up its huge flower stem in its second year of growth. Other monocarpic herbs are Angelica and Giant Hogweed.” More info here.